8 Ways to Save Money on Your OSAP Loan - ScholarshipsCanada.com! Here are some tips and tools to save you money on your OSAP loan! After learning this, I did some more in-depth research to find out how I could save money on my OSAP loans. Here are the tips and tools that I’d like to share with you! 6. You may owe more than you think! You may be unpleasantly surprised to find out that if your study plans changed after receiving your OSAP, you may have received an excessive grant or bursary. This excess needs to be paid back to the government. 5. Alternative payment methods to save you money and preserve your cash. I found out that you’re now able to pay down your OSAP loans using loyalty points! Click here to see how a very cool company called HigherEdPoints.com can help you save some money on your loan repayments by using loyalty points (anyone’s points: your parents, grandparents and even those of your boss!). 4. Prolonging your grace period If you own or co-own a new business in Ontario, or you work/volunteer with a not-for-profit organization you may be eligible to extend the interest free period of your loan. See details here. 3. Check your monthly payment amount If you land a job coming out of school, look into how much you can afford to put down on your loan. If you’re able to increase your monthly payments you could easily save thousands in the long term. Check out this helpful repayment calculator provided by OSAP. 2. Are you eligible for repayment assistance? Once you leave school you may be eligible to receive repayment assistance from both the federal and provincial governments. They evaluate your family income and how much you earn from your current job to see if you are eligible. Check here to see if you’re eligible for repayment assistance. 1. Who do you have to pay back? You actually don’t pay money back to your school or OSAP, rather, you repay the National Student Loans Service Centre. This is a common mistake made by students every year! 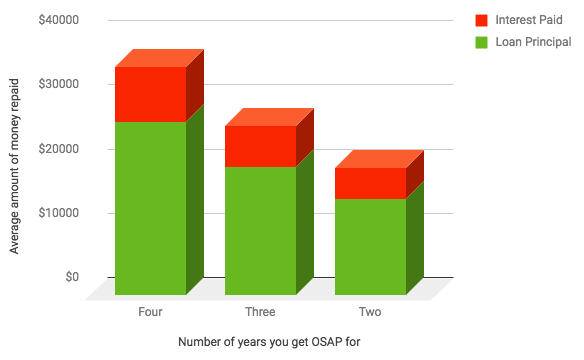 Next steps to saving money on your OSAP loan OSAP is just one source of funding, there are many more you can take advantage of! Check out this overview of other available sources and 8 tips on how to take advantage of them.